I have only seen one white pointer - a specimen around 3 meters long which was raiding my commercial snapper longlines at Little Barrier Island in the mid 80's. It stayed in the area for a couple of weeks and I encountered it four or five times. It would turn up when longlines were being hauled, eat it's fill of 20 or 30 fish then disappear till next time. It always severed the fish cleanly at the head. Several commercial boats had fish taken - this white shark had a distinct preference for large porae over snapper. From this experience, and a lot of experience with other types of sharks, I believe a struggling hooked fish is probably the most powerful shark attractant available. Sharks can pick up vibrations from struggling fish from considerable distances almost instantly, this is probably what brought the shark to Paul Morris's kayak in the first place. When the shark arrived it took some fish from Paul's longline which likely put it into a feeding mode, the added smell of blood in the water from the fish it had mauled would have probably kept in interested in the area. Blood from the bait and burley thrown overboard, and any that was being washed off the deck, or out the cockpit drains of the kayak would certainly maintain the interest of a white shark. Fresh vomit and other excreta and the bleeding from the badly cut knee would have all have certainly added to the sharks ongoing curiosity in the kayak. Marine mammals are a major food source for great white sharks and these reactions are likely to be universal among injured or distressed mammals. It could be a signal to the shark that it is winning. If you are setting a longline from a kayak, I would suggest baiting the line on shore, or at least have the bait cut up and in a waterproof container on the kayak, line setting times and bloody mess are easily minimised with a bit of preparation. When hauling the line, do it as quickly as possible and iki or kill the fish as soon as they are landed. The vibrations of a dying fish left on deck will be amplified by the hull. Keep all fish and bait as well as any burley in leak proof containers. Doing this will make any blood and offal less likely to leak or wash over the side and possibly set up a burley trail leading straight to the kayak. It is a fact that the boldest and fastest shark is the Mako, they are also far more common than great white sharks. While fishing on the west coast I had a mako of less than two metres long attack the propellor on a four metre aluminium boat while it was at anchor, I bashed it on the head with the gaff and it turned and charged the boat with such ferocity I was amazed it didn't kill itself in the ensuing collision. Another mako, about the same size bore down on me while I was diving at Whitianga. It covered the 30 metres gap between us in about one second, it swam in a very erractic motion, and veered around me less than a metre from my mask before disappearing. I believe Kayak fishermen are far more likely to be approached by makos than white sharks and strongly recommend you do not strike out at them because of the possibility of an aggressive reaction. Above : Paul Morris surfing a big one at Pakiri Beach. 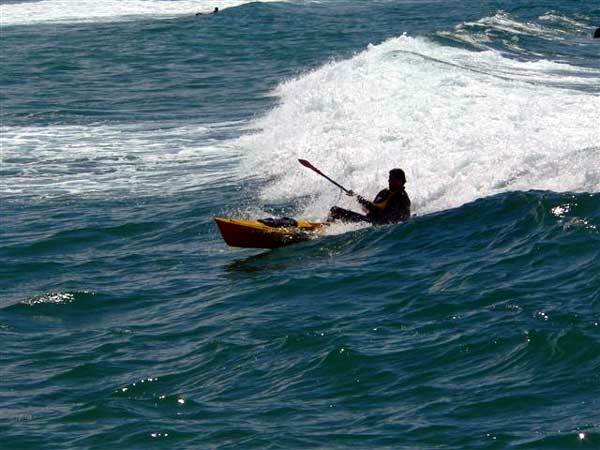 He is back into kayak longlining but is now a lot more particular about housekeeping at sea.